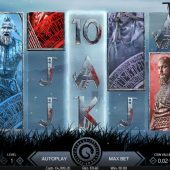 Vikings slot has been touted as the turning point in Netent's usual low-potential generic games and initially it does indeed look the part. The scene is set over a dark rural background from the Viking age with several references to legends in view such as Odin's Ravens which you may remember from Thunderstruck 2, a longboat in the fjord and a shield. Some threatening music gently plays as we spin with dramatic clashes of swords, roars and drum rolls when wins appear. 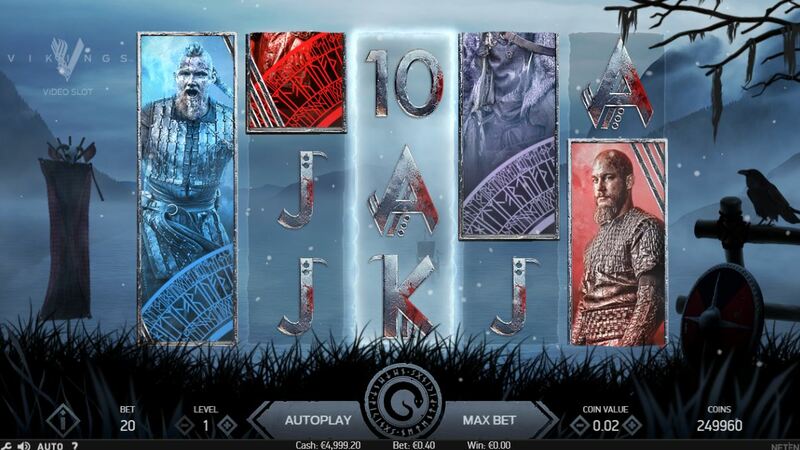 There are many slots with this theme including Viking Vanguard and Vikings Go Berzerk but this really catches the eye more than they do, so will it spell pillaging or Valhalla for our bankroll? This game is a rare 243-way one from Netent, usually restricted to slots such as Twin Spin, so we get 5 reels of 3 rows each - for now. The line pays for 5-of-a-kinds aren't great and we don't even see a Wild here but this isn't a cause for concern as we'll discover. Icons are stacked and the Golden V pays us 2.5x our 20-coin bet, Red Warrior or Freya or Blue Warrior or Grey Warrior all 1x with 5 card values all at 0.5x. You see Shield scatters on reels 3, 4 and 5 but there's more here on Vikings slot before we get to that main feature. On reel 3 there is a blue surround and if any of the 4 warriors described above appear fully-stacked they will all transform to the same one in reel 3 and pay scatter awards. This means you could see 15 in view and they all pay the same for 15 at 243x bet. You can randomly trigger the Shield Wall feature whereby on any spin a cluster of Shields may land and all transform to same symbol. If you do get 3 scatters on the last 3 reels then some big hits could be landed! This is because you earn 7 free games and your grid turns into a 7-reel and 5-row slot with 78,125 ways to win. Not only that, you now get 3 Hotspots on the 3 centre positions of all the middle 3 reels i.e. 3, 4 and 5. You cannot retrigger the free spins or gain extras but the Shield Wall feature can still occur randomly and as with the base game the Warriors pay scattered, but now you could get up to 27 of them in one spin! Should this occur you will win 10,000x bet but obviously there is a decreasing scale for pays right down to just 3 for the triggering stack on its own. The magic 1000x will be reached for 19 or more scattered Warriors.